Latest New deal from Liverpool. Attacker Philippe Coutinho has signed a new long term deal at the Anfield Stadium, according to Liverpool official website. Liverpool attacker Philippe Coutinho has signed a new long term deal at the Anfield Stadium, according to Liverpool official website. Philippe Coutinho has finally penned £150,000 a week deal at Liverpool which will keep him until 2022. The contract has no release clause. The Brazilian arrived at Anfield Stadium from Inter Milan for £8.5million in 2013, he has been great since his debut for the Reds. He has netted 34 goals in 163 appearances in all campaigns for Liverpool. The 24-year-old has been eyed by several top sides including Barcelona and PSG. However, his recent commitment means that he has no plans to leave the club in the near future. 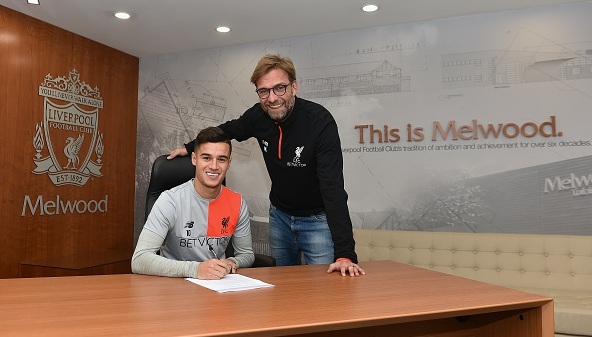 Coutinho after signing the new contract revealed his happiness that he is very grateful to the club and the boss. Coutinho has scored six goals in 14 appearances this season. He will be featuring in tonight’s second leg of League Cup semifinal against Southampton. He had been in talks over this new deal for the past few days and it was expected that he will commit easily. But will this mean an end to Barca’s interest in him? Luis Suarez also did the same in the past, signed a contract and left in the summer. However, a new deal will certainly increase his value.